Comment on the Mughal empire. Stuart Cary Welch. India: Art & Culture 1300-1900. 1985. Motifs of tiny leaves and bejeweled blossoms are depicted in delicate gold filigree petals, accented with a subtle smattering of sparkling diamonds, while faceted rose quartz and white diamonds, set in rich 18ct yellow gold, create beautiful floral blooms. Inspired by long treks under the Indian sun, the collection depicts the disintegrating murals that adorn the walls of the ancient Indian forts, that Natalie discovered on her travels. In particular the Rani Mahal in Bundi, Rajasthan, which was once a grand palace for the Maharani (wives and mistresses) of the original rulers and now stands overgrown and overrun with wild monkeys. Imagining the jewellery treasures of the women who once lived there, the collection’s fragmented aesthetic hints at a forgotten grandeur. Mixing its age-old inspirations with modern silhouettes and jewellery styles, the collection is designed to be interchangeable, instantly wearable and collectible. It comprises layering necklaces, earrings, studs, rings, bracelets, cuffs and ear jackets, which can be adapted to any style or occasion. Not only beautiful in style but also in provenance, the collection is made from certified Fairtrade Gold ensuring a more ethical and sustainable product – proving stylish jewellery can be created without compromise. Notable pieces in the collection include the elegantly light and airy, Lace Flower Earrings that emulate the intricate jali windows common in Indian architecture, paired with the elegant Petal Ear Jackets that perfectly sculpt the ear. The versatile Gemstone Flower motif is echoed throughout the collection and can be set with a choice of gemstones or diamonds. 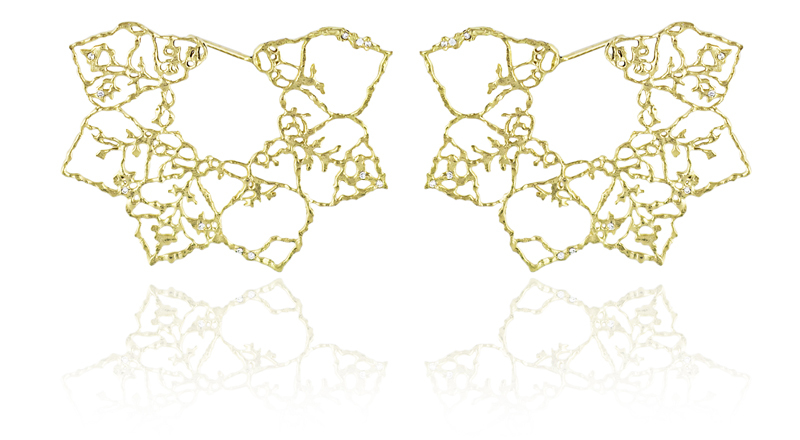 The collection is available online at www.natalieperryjewellery.com and La Maison Couture.